Shwetark Ganpati is one of the purest and rarest sacred item on this earth. 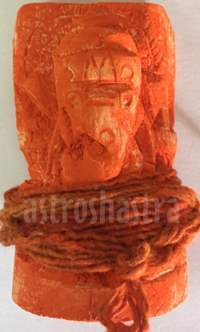 Ark Ganesha is obtained from the root of a shrub, that takes the form of Lord Ganesha. In Sanskrit it is called Ark and in Hindi known as Aak. This Aak plant has green and blue leaves. Its flowers are of small size but without any fragrance. The Aak plant has a rare white plant which also has shite flowers. This is a rare plant and cannot be found easily. The plant of aak has been in the traditional religious and cultural practice since the time immemorial. Its leaves are used for Sun worship . The leaves and flowers of this plant are considered to be very sacred in the Hindu mythology. Leaves of madar along with the flowers and fruits of Dhatura plant are used in the worship of Lord Shiva. The garlands of flowers of Swetark are used in the worship of Lord Hanuman. In our shastra, it is laid down that in any house where white Ganapati is available, the house remains free from all evils and the possessors are blessed with immense wealth. This is used for puja, when onces this Ganapati is awakened, nothing becomes impossible for the sadhak. The root of this white Aak must be taken out carefully. 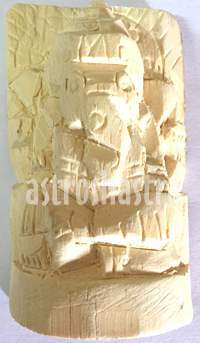 When the bark and thin wood over the root is peeled off, one will see an image of Ganpati below it. Some people take the root of a white Aak to the carpenter and get a Ganpati made. This is used for doing sadhana according to Tantra shastra. The Shastras say, that any house which has a white Ganpati remains free from all evils and the possessor is blessed with immense wealth. 1. It increase the Vigour, vitality and enthusiasm. 2. It helps in attaining sprituality. 3. It helps in geting the blessings of Lord Shiva and Maa Partvati. 4. It Gives knowledge and improve concentration power. 5. Promotion in job and increase in business. 6. It Maintains harmony in married life. 7. It is very helpful in eliminating illness and diseases. 8. It gives Prosperity and growth. 9. One gets rid of hardship or insufficiency. 10. Shwetark ganesh idol activate positive energies in the house. How is Shvetark Ganesha kept in home and office ? It shall be kept only after energzing with proper mantras and rituals, therefore it is advisable to buy energzied ganesha only. It is kept on Red Cloth on any auspicious day. One should lite an incense or diya in front of it daily. Chanting the beej mantra daily for 108 times is highly beneficial. One shall chant the mantra "Om Gang Ganpatye Namah" 108 times daily.